In the summer of 1998, I was traveling home from a visit to my mother in New York. In those days, I traveled quite a bit for business and had reached a high status on America West Airways assuring me a first-class seat on most flights. On this particular flight, I found myself sitting next to Bill Post, the CEO of our local electric utility, Arizona Public Service. It was a fortuitous meeting. In our conversation near the end of our flight, we started talking about electric cars—about whether there would be a near future where the internal combustion engine (ICE) would become a thing of the past. Bill indicated that he thought it was quite a bit in the future but that there were some promising advancements. This is where I first learned about the General Motors EV1, the first, albeit limited-production electric vehicle from a U.S. automaker. Before we deplaned in Phoenix, Bill offered to let me borrow one of APS’ EV1s for a day or two. He gave me his secretary’s phone number and suggested I call her. At the time, I was two years into a 42-month lease on a new red Porsche 993 Targa. Having found success in business, this was my dream car. It was expensive and powerful and it made me feel powerful. I called Bill’s secretary that Friday morning and arranged to pick up the EV1 on the following Tuesday. After just one day of driving the EV1, I was hooked. The car was amazing. It had good acceleration (it was actually quicker than the Porsche) but most amazing was how I felt contributing to a cleaner environment. At the time, my wife and I had been married eight years with no kids. We were both vegetarian and conservationists, but we had not made many significant lifestyle changes to benefit the environment. It was time. 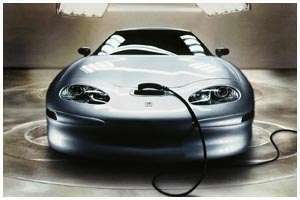 In July of 1999, the Porsche went bye-bye and I took ownership (actually, it was a lease) of a 1999 General Motors EV1. Driving an electric car inspired me to change my driving habits completely. I slowed down, coasted down hills when possible, and used the regenerative braking to recharge the battery. It was great. I thought I would never go back. I joined the EV1 “Owners Club” and followed the technology, hoping for a family car as our first child arrived early the following year. But just two years into that lease, the bad news arrived. GM was abandoning the project and all leased cars were to be returned after the leases expired. A year later, I returned my EV1 to the dealer, disappointed but confident that the technology had proven and that there would be an electric car future once battery technology advanced and the range of such cars extended. In the meantime, we bought a Mini-Cooper that was good for a toddler and a baby and then eventually replaced it with a 2006 Mercedes-Benz E320 CDI (Diesel) that with cleaner diesel fuel seemed like a good choice. A 4-door car was now necessary to satisfy two growing children and an aging back. When the Japanese hybrids arrived, I was not thrilled. Although they were more efficient, they were still just electrically assisted internal combustion engines, not electric motors. Last year, I started to look seriously at replacing the Benz, which had close to 100,000 miles on it. Most of my driving is local but we have a cabin in the mountains and any EV would need substantial range to make the 120-mile 3,000 ft. uphill climb during the summer where daytime temperatures can reach 112ºF plus. I considered the Nissan Leaf EV, but the range at 75 miles (under normal conditions) is too limited and the car too small to meet the needs of my now two-child, two-dog family. The Volt, being the successor technology to the EV1, made more sense. The Volt range is probably 40 miles or less in the summer heat and then an ICE kicks in and keeps the battery charged. It is an electric drive, so it still counts as an EV. However, there still is that internal combustion engine. If this were just a decision about gas mileage, I would have opted for the Volt, but this was about something more. I really want a pure EV. I believe in the technology and if we want to help EVs become the norm, we need to invest in it. Then along came the Tesla Model S, an EV that simply meets all of our needs as well as our wants. The range is substantial at 260+ miles. It is a spacious, full-size 4-door and able to comfortably carry 4 adults and lots of gear. There is even room for the dogs. It is a gorgeous automobile that brought an unprecedented unanimous vote by the judges for Motor Trend’s Car of the Year 2013. 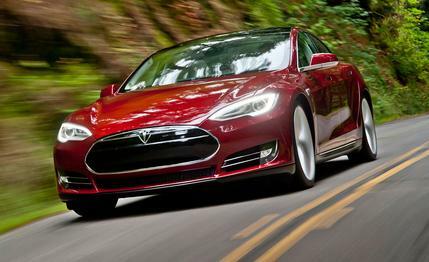 The Tesla Model S is truly a state-of-the-art vehicle and it is our choice to replace the Benz (and EV1). Besides, I already have the power dedicated for an EV in my carport. We expect to take delivery in July. What do you already have in your carport? Is it something GM recommended, a general dryer/stove plug, regular NEMA 5-15, or…? I already had the carport wired for the EV1 charger (still have it, by the way – not sure what to do with it), so it was simple to convert it to a NEMA 14-50.